Is this worthy letting people know of the Schumann resonances lately. The page is Russian but you can see by the picture/graph the Schumann resonances seem to be all over the shop. I've heard it went up into the 30's, Schumann resonances is usually 7.83 from memory. Can the Zetas comment on this and the effects on public/animals etc. [and from another] http://sosrff.tsu.ru/?page_id=7 [and from another] https://www.drjoedispenza.com/blog/consciousness/what-does-the-spik... In 1952, German physicist and professor W.O. Schumann hypothesized there were measurable electromagnetic waves in the atmosphere that existed in the cavity (or space) between the surface of the earth and the ionosphere. According to NASA, the ionosphere is an abundant layer of electrons, ionized atoms, and molecules that stretches from approximately 30 miles above the surface of the earth to the edge of space, at about 600 miles. As far back as we know, the Earth’s electromagnetic field has been protecting all living things with this natural frequency pulsation of 7.83 Hz. You can think of this as the earth’s heartbeat. The ancient Indian Rishis referred to this as OHM, or the incarnation of pure sound. Whether by coincidence or not, the frequency of 7.83 Hz also happens to be a very powerful frequency used with brain wave entrainment as it’s associated with low levels of alpha and the upper range of theta brain wave states. This frequency has also been associated with high levels of hypnotizability, suggestibility, meditation, and increased HGH (human growth hormone) levels, in addition to increased cerebral blood-flow levels while this frequency is being stimulated. On January 31, 2017, for the first time in recorded history, the Schumann resonance reached frequencies of 36+ Hz. It was considered an anomaly when in 2014 this frequency rose from its usual 7.83 Hz to somewhere in the 15-25 Hz levels—so a jump from 7.83 Hz to 36+ Hz is a big deal. That’s more than a five-fold increase in resonant frequency levels. What does this mean to us as inhabitants of Mother Earth? According to neuroscience, frequency recordings of 36+ Hz in the human brain are more associated with a stressed nervous system than a relaxed and healthy one. [and from another] https://en.wikipedia.org/wiki/Schumann_resonancesSchumann resonances occur because the space between the surface of the Earth and the conductive ionosphere acts as a closed waveguide. The limited dimensions of the Earth cause this waveguide to act as a resonant cavity for electromagnetic waves in the ELF band. The cavity is naturally excited by electric currents in lightning. In the normal mode descriptions of Schumann resonances, the fundamental mode is a standing wave in the Earth–ionosphere cavity with a wavelength equal to the circumference of the Earth. [and from another] https://www.godlikeproductions.com/forum1/message3595879/pg1 The found resonance of earths frequency was found in the 50,s and has been on that frequency of 7.83 hz up and until a couple years ago where spikes have occurred, some jumped to 14hz then 30hz and a couple months ago spiking up to 60-80-120hz. Our brains and bodies are tuned into earths 7.83hz and as far as has been known has always remained at that frequency. 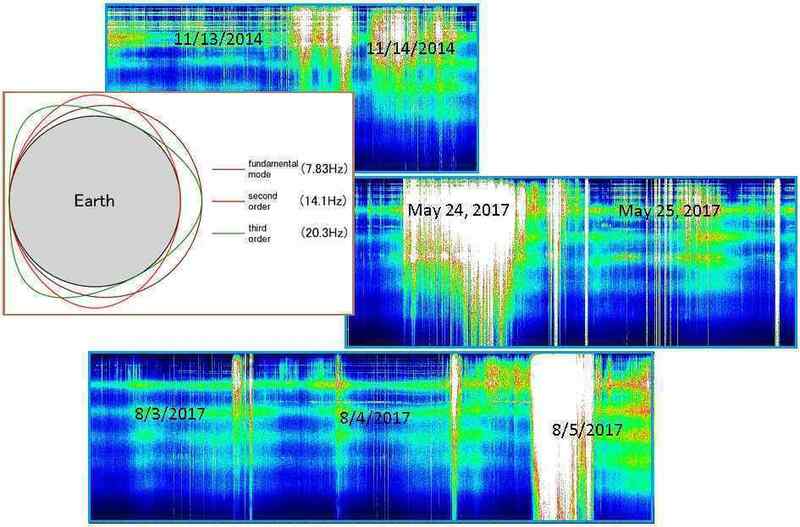 As we explained a year ago, when the Schumann Resonance was spiking, this is caused by the magnetic blast coming from Nibiru, interfering with the Earth normal magnetic field. Magnetons want to escape at the Earth Equator, but are pulled back, thus a push/pull creating a base wavelength. Nibiru increases the push/pull, thus the extreme increase from the regular 7.83 Hz of the resonance. Earth creatures have evolved to expect 7.83 Hz, so this creates fatigue and irritability in man and animals, but no other health effects, and will pass with the Pole Shift in time. Schumann Resonance showing a strong magnetic blast coming from Nibiru for 14 of the past 22 hrs. Spiking well above 40 Hz and without interruption for over 7 hrs. and still ongoing at the time of this post.